Events: TS Hawkins performs at Sounds from the Underground! Join the artists of Svaha Theatre Collective for their first fundraiser! Inspired by the work of Sarah Kane’s iconic In-Yer-Face theater, Svaha will be hosting An Evening of Sounds From The Underground. Inspired by themes of our next show, PHAEDRA’S LOVE, Kane’s brutal exploration of the nature of love and family, of judgement, justice and truth - this evening will feature the bold voices of some of Philly’s incredible artists. 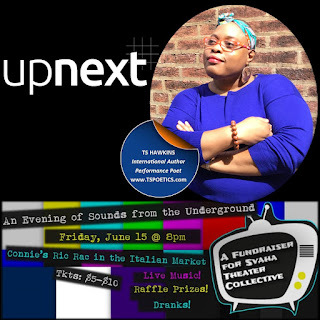 Groove to the tunes of political resistance and recreational drugs, snape to the poetic stylings of social justice, grab a city wide and a raffle ticket to take home some original artwork, jewelry, and hand-crafted beer - all in the support of Svaha Theatre Collective. TS Hawkins is an international author, performance poet, and playwright. Plays & shorts include: Seeking Silence, Cartons of Ultrasounds, Too Late to Apologize, They’ll Neglect to Tell You, #RM2B, The Secret Life of Wonder: a prologue in G, AGAIN, #SuiteReality, and "don't wanna dance with ghosts...". AGAIN, was acknowledged for having the "Best Theater Moment of 2017" and #SuiteReality received the 2017 "Reality Check" Surya Bonaly Award. Books include: Sugar Lumps & Black Eye Blues, Confectionately Yours, Mahogany Nectar, Lil Blaek Book: all the long stories short, and The Hotel Haikus. 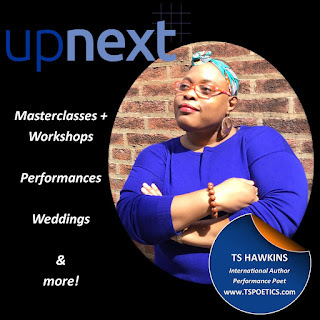 Hawkins is best known for creating the masterclass "Thriving Ain't Easy"; a poetry course that infuses health, wellness, and activism through poetry.